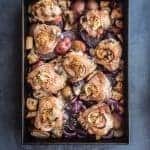 Super quick, simple, and delicious sheet pan chicken dinner with potatoes and sourdough, just as perfect for a weeknight meal or easy dinner party entertaining! 1) Preheat oven to 400. 2) On a large rimmed baking sheet, toss the bread, potatoes, onion, garlic, butter, half the herbs (oregano & rosemary), crushed red pepper together. Drizzle with the olive oil and season with salt and pepper, mix so all is coated and spread in an even layer. 3) Top bread and potato mix with the chicken. Top chicken with cut up lemon slices and the rest of the herbs. 4) Roast the chicken and bread mixture for about 45 minutes, until the bread is crisp and an instant-read thermometer inserted in the chicken registers 160°. If you’re gluten-free then omit the bread. If you’re dairy-free then sub oil for butter. If ya wanna add another veggie to the potatoes and onions, go right ahead I say. Drying the chicken before baking and using a thermometer to ensure the chicken comes out perfectly moist with crispy skin each and every time. Leftovers will keep up to 4 days in the fridge.